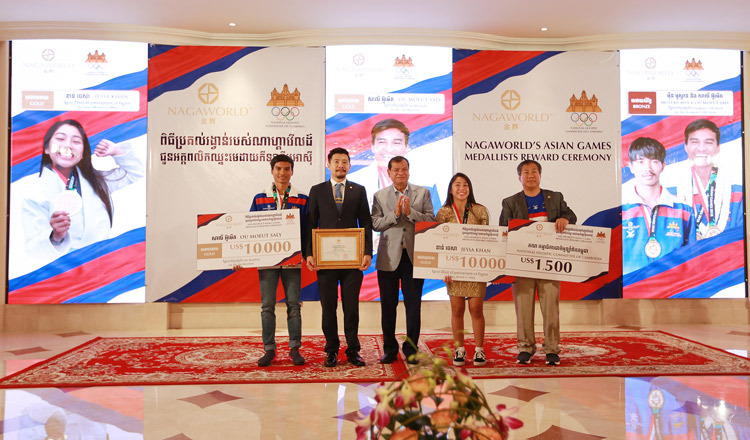 Celebrating the Kingdom’s record-breaking medal haul at the recently concluded 2018 Asian Games in Indonesia, NagaWorld gave rewards to Asian Games medallists at NABA Theatre @ Naga2 on September 5 . 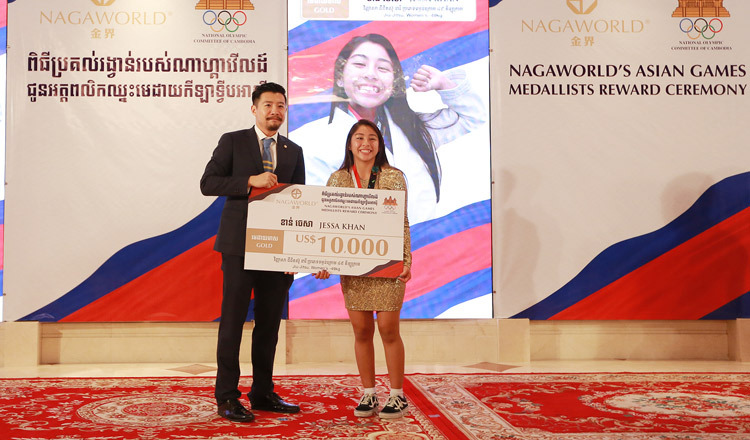 Jessa Khan, Gold medallist in the women’s-49kg jiu-jitsu competition and Ou Moeut Saly, men’s ski modified jet ski champion were awarded $10,000 each. 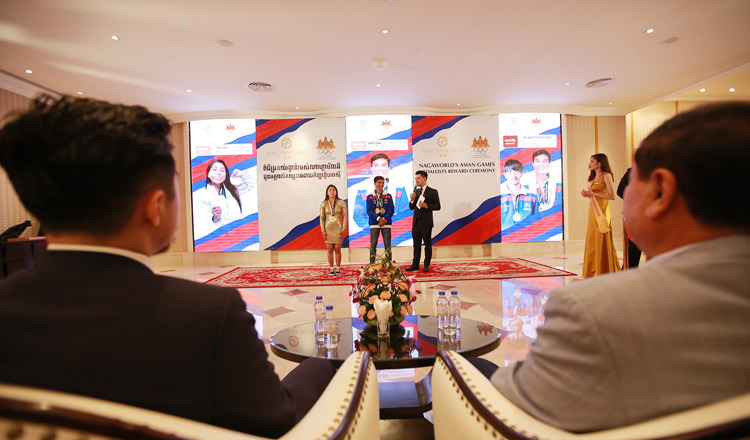 Dr. Thong Khon, Minister of Tourism and President of the National Olympic Committee of Cambodia (NOCC), NOCC officials, local athletes and NagaWorld’s senior management were present at Wednesday’s event. Ou Moeut Saly (left) and Jessa Khan (2nd from right) display their NagaWorld awards alongside Pern Chen, Executive Director of NagaWorld (2nd from left), Minister of Tourism and Chairman of the National Olympic Committee of Cambodia Thong Khon (centre), and NOCC General Secretary Vath Chamroeun. 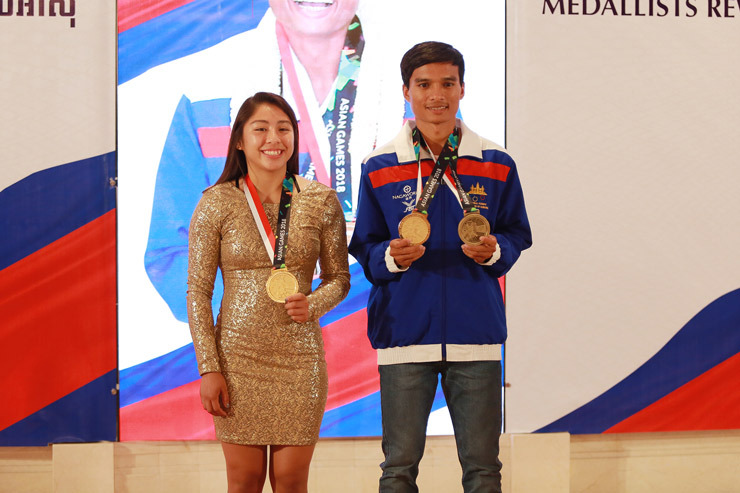 Gold medalists Jessa Khan and Ou Moeut pose with their medals on.